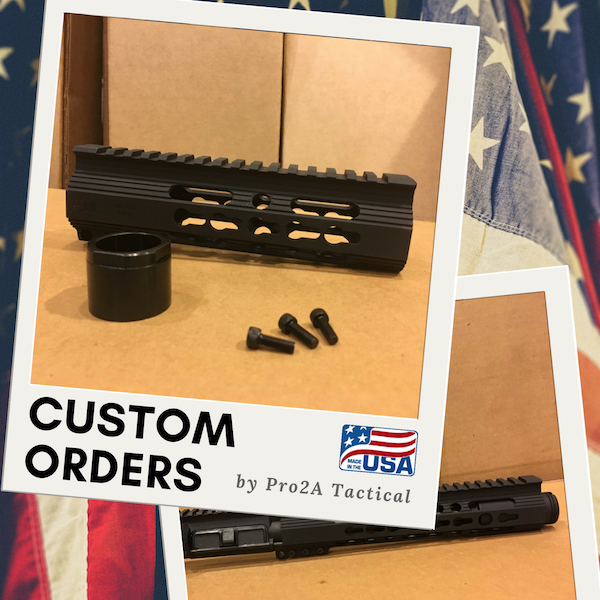 Here at Pro2A Tactical, we believe in doing business in an open, honest and transparent way. As the saying goes if you do good business, you have nothing to hide - that is why unlike most in the industry, we will always disclose where we get our parts from. We believe if you use great quality parts, the customer should know about it and would even appreciate it. We are a small time dealer and do not pretend to be something we are not. We only partner with well-known companies who make quality parts and make them in the USA. Check out our excellent feedback on GunBroker.com. We get most of our barrels from Kak Industry, Ballistic Advantage, Faxon Firearms, Palmetto State Armory, Anderson Manufacturing, Bear Creek Arsenal, Spinta Precision, Brownells and MidwayUSA, unless otherwise specified. We believe these companies make excellent barrels at affordable prices and judging from their reviews, we are sure you will be happy too. We get most of our upper receivers from a company called Matrix Arms (or Matrix Aerospace), unless otherwise specified. They are headquarted in NH and they make great quality parts. Matrix Arms is a reputable manufacturer that also makes upper and lower receivers for Ruger and other major firearm manufacturers. Their upper receivers are made from milspec 7075 T6 Aluminum and has standard M4 feed ramps. We get our rails from Matrix Arms too. Their handguards / rails are very sturdy, lightweight and slim. It is very comparable to many other handguards that typically cost twice or 3x as much. We have sold a bunch of these and we have never had a customer that was unsatisfied with them. We also do custom uppers or special requests. If you do not see an upper with a configuration that you desire, please contact us to see if we can help. We offer a lifetime warranty on all our uppers against defects in materials or workmanship to the original purchaser. This does not include normal wear and tear or cosmetic issues. upper has been disassembled / reassembled improperly.